Committed to the principles of academic freedom and administrative autonomy, President William Friday strongly opposed the Speaker Ban law. Image courtesy of the North Carolina Office of Archives and History, Raleigh, NC. Enacted in 1963, the Speaker Ban was a North Carolina state law that restricted the appearance of Communists and other radical speakers at state-supported campuses, including the University of North Carolina. The Speaker Ban sparked a major controversy over Communism, academic freedom, and the First Amendment. Controversies about radicalism were not new to UNC. President Frank Porter Graham had allowed radicals, including Communists, to speak on the campus during the 1930s. Communist intellectual Herbert Aptheker spoke on campus in the 1950s. Former UNC student Junius Scales was active in Chapel Hill during and after his time as a student in the 1940s and 1950s, and Scales’s activities as local Communist Party boss earned him a prison term under the federal Smith Act. Another Communist student, Hans Freistadt had received a scholarship from the Atomic Energy Commission. When former UNC President Frank Graham ran for Senate in 1950, one of the factors in his defeat was the number of Communist-influenced groups he had been involved with (although Graham had opposed the Communist element in these groups). The House Committee on Un-American Activities (HUAC), in a 1956 hearing, located some active communists at a few state-supported campuses. UNC Trustees and administrators had varying responses to these events. In 1949, the University’s Board of Trustees had denounced Communism while affirming support for academic freedom as a bulwark against the Reds. Pursuant to a 1941 law, Communist Party official John Gates was banned from speaking on campus in 1949. The Chapel Hill campus imposed an anti-Communist oath on its faculty. UNC-Chapel Hill rescinded the oath in 1959 while proclaiming that no communists would be hired. One of the immediate catalysts for the Speaker Ban law was the behavior, in the early 1960s, of some Maoists associated with the group Progressive Labor (later the Progressive Labor Party). These Progressive Labor (PL) activists were active in Monroe, North Carolina trying to win over the supporters of fugitive militant Robert F. Williams. Distrusted by the exiled Williams himself, Progressive Labor activists saw Monroe as the headquarters of a plan to radicalize the entire South. PL recruited a few members on the Chapel Hill campus of the University of North Carolina. The head of PL, Milton Rosen, spoke on the Chapel Hill campus in 1962 at the initiative of PL activists and so did local Monroe activists facing kidnapping charges in connection with the 1961 Monroe race riots. The state and local American Legion objected to the appearance of radical speakers at UNC. WRAL TV commentator Jesse Helms objected to what he considered UNC’s promotion of left-wing speakers while he disclaimed any support for a legislative ban. State legislators appropriated funds for UNC yet worried about the alleged radicalism of the University. Meanwhile, civil-rights demonstrators in Raleigh protested segregation in such establishments as the Sir Walter Hotel, where many solons roomed during the legislative session. Some legislators were not disposed to make distinctions between civil-rights demonstrators and Communist agitators. In this context, the Speaker Ban was passed on June 25, 1963, without significant legislative debate. The Speaker Ban law applied to three categories of persons: “known” communists, those “known” to advocate the overthrow of the Constitution, and those who had pled the Fifth Amendment in an investigation concerning Communism or subversion. Persons in all three categories were forbidden from using the campuses of state-supported schools for speaking purposes. One of those who ran afoul of the law was the prominent geneticist J. B. S. Haldane. Haldane was making arrangements to speak at UNC as part of a tour of the United States. Haldane, an Englishman living in India, had been a member of the British Communist Party, but had quit. Haldane had not publicized his resignation because he thought this might unduly promote Cold War feeling in the West. Haldane’s reticence about his past delayed his obtaining a U.S. visa. Around the time Haldane got his visa the Speaker Ban was enacted in North Carolina, and Haldane was asked on behalf of the University to explain his former Communist associations. Haldane declined to do so, as he had with the State Department, and he omitted UNC from his American tour. Another inadvertent target of the Speaker Ban was the playwright Arthur Miller. A professor at UNC-Chapel Hill decided not to invite Miller to speak about his play “The Crucible,” based on a mistaken belief that Miller had taken the Fifth Amendment about Communism. Miller had been a recalcitrant witness before the House Committee on Un-American Activities (HUAC), but he had not taken the Fifth. In 1965, the NAACP chapter on the Chapel Hill campus wanted to invite Carl Braden. Braden ran the Southern Conference Education Fund, a group dedicated to rallying white southerners behind the cause of racial integration. Braden and his organization had often been accused of being Communist, and Braden had served a prison term for refusing to tell HUAC whether he was a Communist. Braden had not pled the Fifth Amendment at this hearing (hence the prison sentence for only the use of the Fifth Amendment could assure a recalcitrant HUAC witness from being imprisoned). It was far from clear that Braden came within the terms of the Speaker Ban, but the UNC-Chapel Hill administration got a decision from the state Attorney General’s office that the Speaker Ban applied to Braden. Braden ended up giving his talk to an audience at the Chapel of the Cross Episcopal Church, near the campus. Another casualty of the Speaker Ban was Clement Lawrence Markert, a prominent research biologist. During the 1960s, Markert was a professor at Johns Hopkins and then chairman of the Biology Department at Yale. Plans to invite Markert to speak at the UNC-Chapel Hill medical school proved abortive when the potential sponsors learned of Markert’s political background. Markert had been a Communist in the 1930s, joining the Communist-sponsored Abraham Lincoln Brigade to fight alongside the Spanish Loyalists in the Spanish Civil War. In 1954, Markert invoked the Fifth Amendment when the House Committee on Un-American Activities asked him about his Spanish adventures and his Communist background. (Markert was suspended, and then reinstated, from this then-position at the University of Michigan at Ann Arbor.) Because he had pled the Fifth a decade previously, Markert was deemed to be within the terms of the Speaker Ban, and hence ineligible for a speaking invitation at any state-supported college in North Carolina. (Many years later, Markert would become a Professor of Animal Science and Genetics at North Carolina State University. By then, the Speaker Ban had long since been abolished). Communist-bloc scholars, appearing as part of academic-exchange programs, were barred from speaking engagements at state institutions. UNC’s administrative regulations implementing the Ban specified that members of “any” Communist Party, foreign or domestic, were banned. This broad rule excluded foreign Communists like Haldane and the Soviet scholars (although John T. Caldwell, Chancellor of NC State, allowed at least on scientist from a Communist country to visit the campus for non-speaking purposes). Considering the role, which Progressive Labor had played in inspiring the Speaker Ban, it is interesting to note that the invocation of the Speaker Ban against members of the Progressive Labor party was fairly spotty. A former UNC student, Larry Phelps, a member of Progressive Labor, spoke informally to students at his former residence hall about a recent trip to Cuba sponsored by Progressive Labor. Phelps had gone on this trip as one of leaders of the tour group. An internal University inquiry later found that Phelps’s speech had violated the Speaker Ban, for Phelps had invoked the Fifth Amendment in a House Un-American Activities Committee (HUAC) inquiry into the Cuba trip. However, no disciplinary action was deemed necessary, and Chancellor Aycock told critics that there was no way for the University to guarantee that such informal appearances by banned speakers could always be prevented. Some other Progressive Labor activists spoke on campus about the Cuba trip, and although campus police chief Arthur Beaumont attended and reported on the meeting, the administration made no attempt to ban the speakers; Progressive Labor was not considered equivalent to the banned Communist Party, and the speakers had never taken the Fifth as Phelps had. Another Progressive Labor activist, Nicholas Bateson, was fired from his research assistantship by the UNC-Chapel Hill administration when the House Un-American Activities Committee found that he had helped procure a fake North Carolina driver’s license for Progressive Labor operative Arnold Indenbaum. UNC administrators had been taken by surprise when the Speaker Ban law passed. Committed to the principles of academic freedom and administrative autonomy, UNC officials such as President William Friday strongly opposed the law. The University’s strategy was to enforce the law while showcasing its alleged abuses. The administration wanted to replace the Speaker Ban with an “open forum” policy. As advocated by UNC leaders, the legislature should allow the various Boards of Trustees to decide when and under what circumstances members of the three suspect classes of people should speak on campus. In the event that the legislature agreed to give appropriate authority to the Trustees, University administrators wanted the Trustees to allow students and professors the freedom to invite Communist speakers. The only restraints contemplated by the University in case of repeal was that, if the administration so desired, Communist speakers could be balanced by speakers of other viewpoints, compelled to answer questions from the audience, and accept a faculty moderator for their appearance. This policy was meant as a codification of pre-existing University practices. In 1965, the regional accrediting agency for North Carolina schools, the Southern Association of Colleges and Schools, indicated that the accreditation of state-supported colleges was in jeopardy. The reason was that the Speaker Ban law was potentially in conflict with accreditation standards that provided that the trustees of a University must be free to run their institution without outside interference. Due to the potential dangers of losing accreditation, the state legislature, at the instance of Governor Dan K. Moore, created a Study Commission to look into the entire Speaker Ban situation. 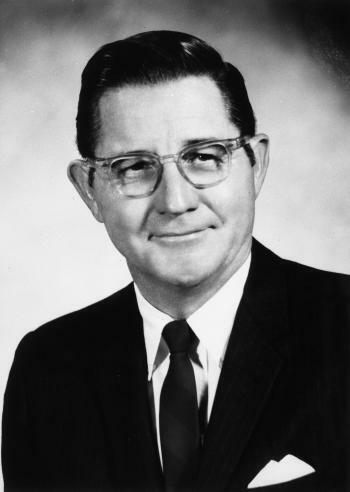 The Study Commission, under the chairmanship of David Britt, soon-to-be Speaker of the state House of Representatives, held hearings over the summer of 1965. UNC representatives emphasized their support for an open-forum policy, but the Commissioners, while genuinely seeking a way out of the Speaker Ban morass, thought that this was insufficient to protect the state against Communist speakers. A more viable, political solution came from East Carolina College in Greenville (later East Carolina University). ECC was then independent of UNC and set its own policy. The trustees of ECC, supported by President Leo Jenkins, had adopted a policy on extremist speakers stating that such speakers should appear rarely and only when their appearance would serve the purposes of education, not the purposes of the America’s enemies. The state legislature and the various boards of trustees enacted the Britt Commission’s recommendations. Although UNC officials hoped that this would put an end to the Speaker Ban dispute, this was not to be. The UNC-Chapel Hill chapter of Students for a Democratic Society (SDS) invited two speakers in order to test the revised Speaker Ban. The first of the two speakers was Herbert Aptheker, an avowed Communist who had previously appeared at UNC, and who had been cited in recent legislative debates as precisely the sort of person who should not appear on campus. Aptheker accentuated his undesirability by visiting North Vietnam in the company of two antiwar activists and praising the Communist side in the Vietnam War. The other speaker invited by SDS was Frank Wilkinson, an activist who advocated the abolition of the House Committee on Un-American Activities (HUAC). Wilkinson had spent time in federal prison for refusing to tell HUAC whether he was a Communist. Before that, he had pled his privilege against self-incrimination in refusing to tell a California court whether he was a Communist. The Federal Bureau of Investigation (FBI) kept close tabs on Wilkinson’s activities and sought to prevent him from speaking at UNC-Chapel Hill and at Duke University (a private institution not subject to the Speaker Ban). Wilkenson eventually spoke at Duke. The UNC administration wanted Aptheker and Wilkinson to speak on campus, but the University Trustees rescinded the invitations and then set up procedures by which the Chancellors at each of the University’s campuses would screen suspect speakers and decide whether students would be permitted to invite them. The administration interpreted the Trustees’ actions as equivalent to a rejection of Aptheker and Wilkinson appearing, so J. Carlyle Sitterson, the interim Chancellor at Chapel Hill, after consulting with a special committee as required by the new Trustee regulations, banned the two controversial personages from speaking on campus. To dramatize the ban on Aptheker and Wilkinson, while setting the stage for a challenge to the Speaker Ban, SDS and its moderate allies in the student body arranged to have the two speakers speak from the Chapel Hill sidewalk adjoining the campus, over the wall dividing municipal and University property. UNC President William Friday was having regular consultations with Paul Dickson, the Chapel Hill student body president and a champion of Aptheker and Wilkinson’s right to speak. Friday had decided that only a federal lawsuit could put an end to the Speaker Ban imbroglio once and for all, and he was willing to help Dickson behind the scenes in setting up the conditions for a federal case. The students who had invited Aptheker and Wilkinson sponsored a federal lawsuit challenging the Speaker Ban law and its implementing policies. The lawsuit was supported by the American Civil Liberties Union, whose North Carolina chapter had just been established, largely in response to the Speaker Ban. In Greensboro, a three-judge federal court in Greensboro heard the Speaker Ban lawsuit. During the interval between the filing of the lawsuit in 1966 and the court’s decision in 1968, several people subject to the Speaker Ban were allowed to speak at the University, based on the new, more permissive regulations. The Chapel Hill campus heard from Yugoslav and Soviet-bloc academics who had been invited by professors on the Chapel Hill campus. (The administration interpreted the Trustee regulations to so as to permit professors, unlike students, to invite whomever they wished without seeking administrative approval). Chapel Hill students invited some Soviet diplomats, whose appearances were approved by Chancellor Sitterson. At the NC State campus, Chancellor John. T. Caldwell allowed invitations to two suspect speakers – American Communist Party boss Gus Hall, and Ku Klux Klansman Robert Jones (who had pled the Fifth Amendment when asked about Klan activities during a HUAC investigation). Hall and Jones declined the invitations. When the federal court decided the Speaker Ban lawsuit in 1968, it found that the law and its implementing regulations were too vague to survive a First Amendment attack. In addition, the court ruled, the restriction on Fifth Amendment pleaders impaired the constitutional privilege against self-incrimination. While declaring the Speaker Ban unconstitutional for these reasons, the court indicated that it might be sympathetic to a better-drawn policy to limit the appearance of radical outside speakers. Citing evidence proffered by the lawyers for the state of North Carolina, the court found that the Communist Party was waging a propaganda campaign to win over college students. The state could have appealed the decision to the U.S. Supreme Court, but Governor Moore believed that the Speaker Ban had already taken up too much political energy. The federal court decision was not appealed, and it became final. Despite the implied judicial invitation to draw up a new and improved Speaker Ban, UNC instead formulated a policy that emphasized broad academic freedom for invited speakers. This was the open-forum policy which University leaders had been pressing for all along. Benin, Leigh Day, The New Labor Radicalism and New York City’s Garment Industry: Progressive Labor Insurgents During the 1960s. Routledge, 1999. Beyond the Wall [videorecording]. Kindem, Gorham (“Hap”), director. ; Chapel Hill, N.C.: GK Productions, 2003.
in Sixties North Carolina. Athens, Georgia: University of Georgia Press, 1999. 1963-1970.” Thesis (Ph.D)–University of California, Irvine, 1994. Law Journal 55 (1966-67): 225-49. Bratton, Mary Jo Jackson, East Carolina University: The Formative Years, 1907-1982. Alumni Affairs, 1986. Clark, Ronald William, JBS: The Life and Work of JBS Haldane. New York: Coward-McCann, 1969. Douglas M. Knight records, Duke University Archives. Carolina at Chapel Hill, 1989. Gottfried, Martin, Arthur Miller: His Life and Work. Da Capo Press, 2003. Thesis, University of North Carolina at Chapel Hill, 1985. Hollingsworth, Peggie J, ed. Unfettered Expression: Freedom in American Intellectual Life. (Ann Arbor, 2000). “Jewish Life at Carolina – Hans Freistadt.” Virtual Museum of University History, UNC-Chapel Hill, http://museum.unc.edu/get_page.html?chapter=19&slide=16. 72 (Spring 1984): 4-11, 25. Kidder, Gerald M, “Clement Lawrence Markert: 1917-1999.” Biographical Memoirs, Volume 83, The National Academies Press [National Academy of Sciences], Washington, D.C., 2003. King, Arnold K., The multicampus University of North Carolina comes of age, 1956-1986. Chapel Hill: University of North Carolina Press, 1987. 1968.” North Carolina Historical Review 72 (April 1995): 198-220. Link, William A. William Friday: Power, Purpose and Higher Education, University of North Carolina Press, 1997. Longley, Maximilian, “Speaker Ban Still Divides: Free Speech Debate Continues Today,” Metro Magazine, July 2005, available online at http://www.metronc.com/article/?id=18. Luce, Phillip Abbott, The New Left Today: America’s Trojan Horse. Capitol Hill Press, 1972. Nagourney, Eric, “Clement Markert, 82, a Biologist Suspended in the McCarthy Era” (obituary). New York Times, Section 1; Page 53, October 10, 1999. Nichol, Gene R. “Bill Aycock and the North Carolina Speaker Ban Law,” 79 N.C. L. Rev. 1725 (September 2001). North Carolina Speaker Ban Collection, UNC-Greensboro, catalogued at http://library.uncg.edu/depts/archives/mss/html/Mss097.htm. North Carolina. Speaker Ban Study Commission. Hearing Before the Speaker Ban Study Commission. Raleigh, The Commission, 1965. North Carolina Civil Liberties Union, “Records, 1964-1987.” Duke University, Special Collections Library. Reagan, Alice. North Carolina State University, A Narrative History. North Carolina State University Foundation and North Carolina State University Alumni Association, 1987. Records of the Federal Bureau of Investigation, 65.2.2 (Investigative records), Class 100 (domestic security, including records relating to Frank Wilkinson and the National Committee against Repressive Legislation, 1942-76). National Archives and Records Administration. Scales, Junius Irving and Richard Nickson, Cause at Heart: A Former Communist Remembers. Athens: University of Georgia Press, 1987. 25. Durham: Duke University Press, 1970. Chapel Hill. Chapel Hill: University of North Carolina Press, 1992. Political Science, University of North Carolina at Chapel Hill, 1995. United States. Congress. House. Committee on Un-American Activities. “Activities of Ku Klux Klan organizations in the United States, Hearings before the Committee on Un-American Activities, House of Representatives, Eighty-ninth Congress, first[-second] session.” Washington: U.S. Govt. Printing Office, 1966-1968. United States Congress. House. Committee on Un-American Activities. “Communist infiltration and activities in the South. Hearings before the Committee on Un-American Activities, House of Representatives, Eighty-Fifth Congress, second session, July 29, 30, and 31, 1958.” Washington: U.S. Government Printing Office 1958. United States Congress. House. Committee on Un-American Activities. “Investigation of Communist Activities in North Carolina area.” Hearing before the Committee on Un-American Activities, House of Representatives, Eighty-fourth Congress, second session. Including index. March 12, 13, and 14, 1956. Washington: U.S. Government Printing Office, 1956. United States. Congress. House. Committee on Un-American Activities. “Investigation of Communist activities in the State of Michigan. Hearings before the Committee on Un-American Activities, Eighty-third Congress, second session .” Washington: U.S. Government Printing Office, 1954. United States. Congress. House. Committee on Un-American Activities. “Investigation of the unauthorized use of United States passports. Hearing before the Committee on Un-American Activities, House of Representatives, Eighty-fourth Congress, second session [-Eighty-fifth Congress, first session]” Washington: U.S. Government Printing Office, 1956-57. United States. Congress. House. Committee on Un-American Activities. (Eric Bentley, Ed.) Thirty Years of Treason: excerpts from hearings before the House Committee on Un-American Activities, 1938-1968. Edited by Eric Bentley. New York: Viking Press, 1971. United States. Congress. House. Committee on Un-American Activities. “ Violations of State Department regulations and pro-Castro propaganda activities in the United States. Hearings,Eighty-eighth Congress, first session, May 6, 1963-September 28, 1964.” Washington: U.S. Government Printing Office, 1963-1964.